The U.S. Census Bureau defines older Americans as those over 65 years of age. In 1990, Americans over age 65 represented four percent of the population; by 2000, they accounted for nearly 13 percent. By the year 2030, one in five people will be age 65 or older. Today in the United States, the life span for men averages 74.8 years, and for women, 80.1 years. The geriatrician treats the medical and psychosocial issues of aging. The gerontologist studies the issues of aging. While they are two separate fields, the research being done by each group has a strong influence on the methods and practices of the other. Supported by the Department of Internal Medicine and the Department of Family & Community Medicine, The Glennan Center for Geriatrics and Gerontology at EVMS offers the highest quality innovative services to this aging population, serving them as they deal with complex medical issues, physical issues, cognitive memory issues, etc. Aging patients face a number of unfamiliar and frightening medical challenges and have special healthcare concerns, including losses in hearing, vision and memory, as well as conditions associated with heart disease, diabetes, arthritis, Alzheimer’s disease and high blood pressure, among others. The Glennan Center for Geriatrics and Gerontology is staffed by dedicated medical professionals who have the special knowledge, training and experience to treat the elderly population. The Glennan Center offers a comprehensive menu of services for every stage of and every aspect of senior healthcare. EVMS and the Glennan Center remain committed to continuing to provide significant health resources to seniors as they get older. 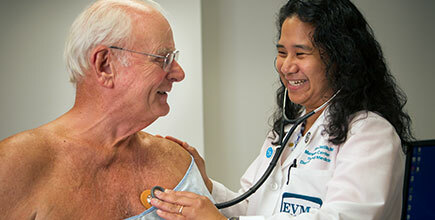 In fact, EVMS was one of the first medical schools in the nation to require that all medical students receive additional training in geriatrics!